And then a firecracker went off in my head. But no, it was no fire I was seeing, it was blood spilling out inside my eye. The most shockingly beautiful blood I have ever seen. The most outrageous. The most terrifying. The blood gushed, but only I could see it. With absolute clarity I watched as it thickened, I saw the pressure rise, I watched as I got dizzy, I saw my stomach turn, saw that I was starting to retch, and even so, I didn’t straighten up or move an inch, didn’t even try to breathe while I watched the show. Because that was the last thing I would see, that night, through that eye: a deep, black blood. Lina, a Chilean writer living in New York, has been forced to live a careful life because of potential eye problems, and this is the moment the sword of Damocles finally falls. The veins behind her eyes have burst, and unbeknownst to those around her, her world begins to drift into darkness. A new phase of her life now begins, and with the help of her partner, Ignacio, she must learn to cope with the situation. The almost complete loss of her eyesight means adjusting to a new way of life while she waits and hopes for a miracle. Surgery is one possibility, but there’s no guarantee that it’ll be a success, even if her doctor agrees to the procedure. Slowly, Lina must come to terms with remaining in her new life in the darkness for good. Seeing Red is a wonderful read, but a scary one in many ways, the story of what follows when what we always feared actually happens. As you might have guessed from the protagonist’s name, there are several autobiographical touches, including her diabetes diagnosis, but it’s still a novel, diverging from the writer’s own experiences. The book consists of many short sections, most of which are written in the first-person, lending an emotional, personal touch to a story depicting the loss of the sense writers (and readers) need the most. Part of the success of the book is the way it takes us away from the visual, forcing us, like Lina to use other senses in order to understand the world. However, these frank admissions are actually subtle attempts to entrap him. This is just the first of a series of selfish actions that culminate in a shocking climax. The main theme of the vein bursting and the wait for the operation is broken up by a visit home. Lina takes a trip to Santiago to see her family while she waits to see whether her eyes will recover, and in this part of the novel the writer touches on recent events in Chile (with frequent mentions of bullet holes in buildings and a dearth of quality newspapers). Ignacio’s parallel trip to Argentina shows another side to South America as that country’s economy has gone down the toilet, a timely reminder that Lina isn’t the only one with issues. 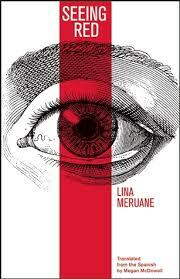 For much of the book, though, we remain trapped in Lina’s perspective, experiencing the surroundings as she does. Having moved into a new apartment in New York, she has difficulty learning to cope with unfamiliar obstacles, yet her return to Santiago grants her some breathing space. She’s able to envisage the city as she left it, directing Ignacio around her home town on their drives. In fact, here it’s Ignacio (a Spaniard) that is blind, struggling with the unfamiliar money, directions and vocabulary. While fairly innocent by themself, these scenes foreshadow how he will become even more lost towards the end of the book. Having developed vision issues, it is much easier for me to read books on my Kindle. That being said, I usually splurge and also buy a hard copy of books I like. Last week I sent an email to Knopf/Vintage pleading for the John E. Woods translation of Mann’s Dr. Faustus to be published in a Kindle version so that I can reread it. As for your recommendation, it’s a book that’s been on my radar for a while, but I’ve never managed to get to it (and I still have a good pile of Japanese books in my personal library to get to!). I really enjoyed this when I read it last year – Meruane also came to the Edinburgh Book Festival. At times I felt the novel bordered on the horror genre! Grant – The ending certainly did!